In our society, the study of language and literature is the domain of poets, novelists, and literary critics. Language is considered a decorative art, fit for entertainment and culture, but practically useless in comparison to the concrete sciences. Just look at the value of a college degree in English versus one in computer science or accounting. But is this an accurate assessment of value? Language is the primary conductor between your brain and the minds of your audience. Ineffective language weakens and distorts ideas. If you want to be understood, if you want your ideas to spread, using effective language must be your top priority.In the modern world of business and politics this is hardly ever the case. In many instances, imprecise language is used intentionally to avoid taking a position and offending various demographics. No wonder it’s hard to make sense of anything! This is hardly a recent problem, and as George Orwell wrote in his 1946 essay, Politics and the English Language, the condition is curable. By following Orwell’s 5 rules for effective writing, you’ll distinguish yourself from competitors and clearly communicate your ideas. This sounds easy, but in practice is incredibly difficult. Phrases such as toe the line, ride roughshod over, stand shoulder to shoulder with, play into the hands of, an axe to grind, Achilles’ heel, swan song, and hotbed come to mind quickly and feel comforting and melodic. For this exact reason they must be avoided. Common phrases have become so comfortable that they create no emotional response. Take the time to invent fresh, powerful images. Long words don’t make you sound intelligent unless used skillfully. In the wrong situation they’ll have the opposite effect, making you sound pretentious and arrogant. They’re also less likely to be understood and more awkward to read. Great literature is simply language charged with meaning to the utmost possible degree (Ezra Pound). Accordingly, any words that don’t contribute meaning to a passage dilute its power. Less is always better. Always. The man was bitten by the dog. (passive)The dog bit the man. (active).The active is better because it’s shorter and more forceful. This is tricky because much of the writing published on the internet is highly technical. If possible, remain accessible to the average reader. If your audience is highly specialized this is a judgment call. You don’t want to drag on with unnecessary explanation, but try to help people understand what you’re writing about. You want your ideas to spread right? This bonus rule is a catch all. Above all, be sure to use common sense.These rules are easy to memorize but difficult to apply. Although I’ve edited this piece a dozen times I’m sure it contains imperfections. But trust me, it’s much better now than it was initially. The key is effort. Good writing matters, probably more than you think. I hope you find these rules helpful, and through their application we’re able to understand each other a little bit better. 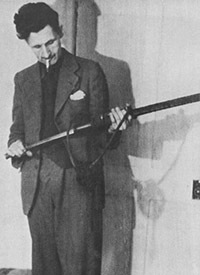 If you enjoyed this post, be sure to read Orwell’s original essay. It contains many helpful examples and is, of course, a pleasure to read.